After what felt like years of delays, Volkswagen announced earlier this month that the Arteon would finally go on sale in the U.S. by summer. The fastback sedan looks great, and in our first drive, we enjoyed its quiet, comfortable ride. But would it really cost $38,000 as early estimates suggested? Not quite. But it’s still quite a bit more expensive than its closest competitor, the Kia Stinger. Volkswagen says that when it goes on sale the Arteon SE FWD will cost $36,840 including destination. If you want the all-wheel-drive version, that price jumps to $38,640. Under the hood, you get a 2.0-liter turbocharged four-cylinder good for 268 hp and 258 lb-ft of torque, with shifting handled by an eight-speed automatic transmission. An adaptive suspension comes standard, as do 18-inch wheels, LED headlights, power-adjustable heated seats, rain-sensing wipers, and an 8.0-inch touchscreen display with support for Apple CarPlay and Android Auto. Choosing the mid-level Arteon SEL brings the price up to $40,940 ($42,790 for AWD) and adds a panoramic sunroof, Napa leather seats, remote start, faux-wood trim, a larger 12.3-inch digital instrument cluster, and adaptive cruise control. For $45,490, the Arteon SEL Premium includes all-wheel drive as standard, as well as 19-inch wheels, a massaging driver’s seat, ventilated front and heated rear seats, a heated steering wheel with paddle shifters, rear climate controls, an upgraded sound system, and more advanced driver-assistance systems. For a sportier look, the R-Line appearance package can be added to every trim for $1,265 if you want 19-inch wheels, and $1,765 if you want 20s. For comparison, a base Kia Stinger starts at $33,985, while the AWD version costs $36,185. 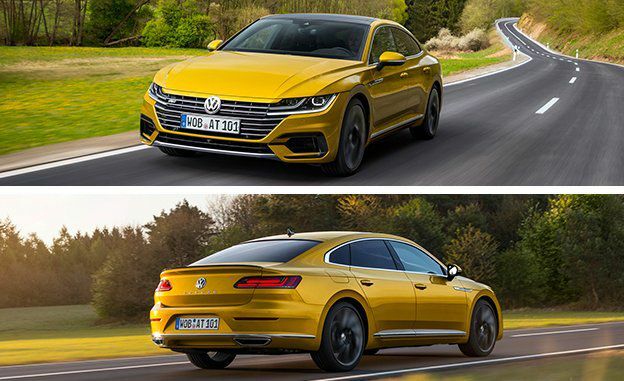 Its 2.0-liter turbo-four is a little down on power compared to the Arteon, making 255 hp and 260 lb-ft of torque, but you do get a sportier rear-drive-based layout. And while Kia requires you to spring for the $46,295 GT1 package in order to get an adaptive suspension, that version also comes with a significantly more powerful 3.3-liter twin-turbocharged V-6. Still, even though the Stinger starts at a lower price, the Arteon offers more technology for your money. The good news is, we shouldn’t have to wait long to do a proper comparison test. According to Volkswagen, the Arteon will go on sale next month.